Superchargers, also known as blowers, huffers or forced induction. The ONLY power adder that's on demand 24/7! This DOUBLE DVD set contains almost 3 hours of highly detailed information. What are they? How do they work? Which type and size should you have for your engine? What do you need to do to an engine to be compatible with a supercharger? What kind of carburetors can you run? What about fuel injection? What kind of cam profile should you run? What do you need to do to the inside of your engine to be compatible with forced induction? Old myths and wives tales about the reliability and street-ability of supercharged engines are finally put to rest! 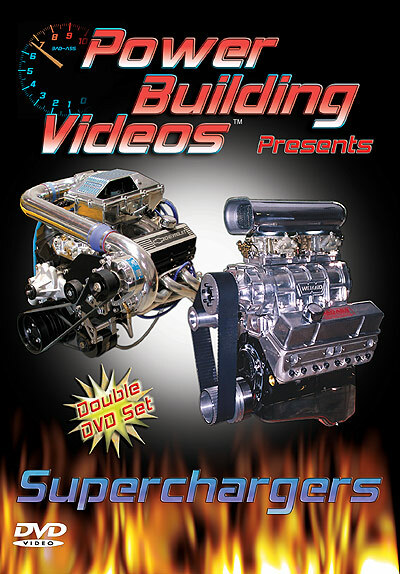 This DVD set takes you through all of that and MUCH more, covering numerous types of blowers (both Roots type and centrifugal types), and several types of engines, with lots of great tips! If you've ever wanted to build yourself a forced induction engine of ANY TYPE, or just wanted to learn about them, then this video is a must! Gain the knowledge and you'll gain the power. KNOWLEDGE IS HORSEPOWER! Click the link below to see preview clips of this title.